Tonight at the American Museum of Natural History in New York, Gizmodo is co-hosting First Comes The Dream. The event will bring together scientists like the host of Cosmos, Neil deGrasse Tyson, astronauts such as NASA Administrator Charles Bolden, software architects like Foursquare's Dennis Crowley, and the writers, designers and artists who inspire them. 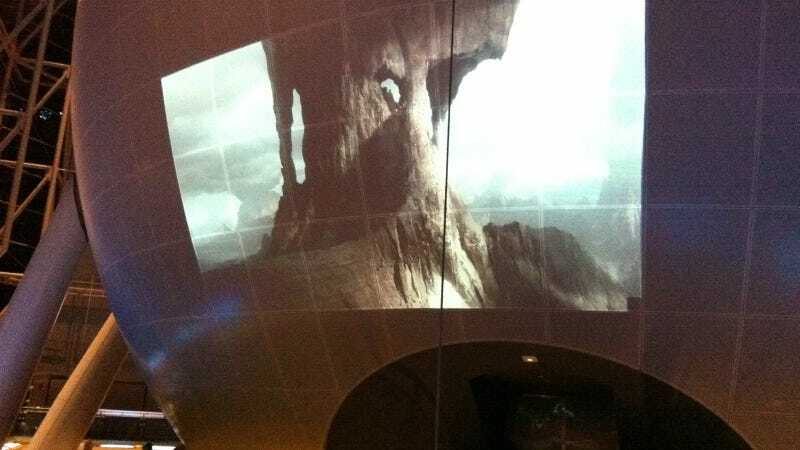 The program is designed to showcase how imagination fuels scientific and technological change: on the inside of the Planetarium we'll have a visual tour of the new worlds recently discovered by astronomers; on the outside, we'll see images of new solar systems from imaginations of the special-effects artists at Framestore. We're asking the guests — both the scientists and the dreamers — to contribute to the series we started here earlier this month, identifying the image or scene that first inspired them. "What was it?" we're asking. Mine was Isaac Asimov's Foundation trilogy. Gizmodo is co-hosting the event because the site's mission is to anticipate the future. But beyond extrapolation, there's a role for imagination; and not just the dark scenarios of environmental doommongers but a boundless future. In short, we need to recapture some of the naivete of the 19th century or the early space age — or our own teenage fantasies. Even a call for naivete seems itself naive in a cynical climate. This might not be the time. But we're calling a turn here — for three main reasons. First, technology has become too important to leave to the technologists alone. Innovation is conceptual; it requires a dream. It is no accident that Apple — a company Steve Jobs prided on bringing the liberal arts into computing — surpassed so many more pedestrian tech industry competitors. Second, we need new dreams because so many of the old ones are played out. Green technologies have been downgraded from world-changers to tokens of dogoodery. The Metaverse imagined by Neal Stephenson has been realized. The personal communicators arrived — and most of them are made by Apple. On Gizmodo we have had to recognize that consumer electronics don't generate the same excitement in either readers or our own writers. We're looking for the next wave too. And lastly, it's time for an end to the self-obsession and pessimism about human nature that seems to pervade our inventions. There is not just something wrong, there's something tediously solipsistic about a society whose main innovation has been the cataloging of itself in social media. Dystopic movies and books have dominated ever since the West's confidence was shaken by the Oil Crisis and subsequent economic stagnation: four decades is long enough. Even Neal Stephenson — author of the dark and inward-looking world of Snow Crash — now misses the optimism of the golden age of science fiction. Sure, that's an optimism that comes from an attachment to novels read when summer vacation and life and the future stretched endlessly before us. But that's an optimism we should hold onto. The way I treasure the enduring influence that Asimov has had on me. Or the way America still harbors a hopefulness left over from the space age, the last time the country achieved something monumental, before everything went wrong. But that's precisely the point of this project and the event marking it tonight. Astronomers this year are discovering worlds around other stars that were presaged in fantasy and the works of Jules Verne. Before Dennis Crowley, one of my co-hosts tonight at the Planetarium, created Foursquare, he was obsessed by Zelda on the Nintendo. What will Gizmodo or Foursquare or Cosmos inspire?